As the stellar jays visiting the seed feeder beyond my window remind me, there's no time to waste, so let’s get right to it this month! In last month’s newsletter I put out a call for adventurous hiking women willing to share their best trip of the year. Annette Hadaway answered the call with a riproaring tale of trekking the Manaslu circuit for 19 days as well as in the Tsum Valley. She was guided by 2 native Nepali women, which turned out to be a very wise choice. Her group was held up safely for two days in a village while others died or went missing, caught in avalanches, landslides and flash flooding. Maybe you heard about this unusual, devastating weather? I asked Annette to share why she decided to trek in Nepal. I also quizzed her about her guides, how she dealt with being a solo traveler during a sudden illness, and the skills she had in her hiking tool chest to deal with such a big adventure. Looking for an Unusual Hiking Gift? Hikers are tough to buy gifts for, once a critical mass of gear has been achieved. But what about a commemorative bench mark medallion from a beloved hiking spot? 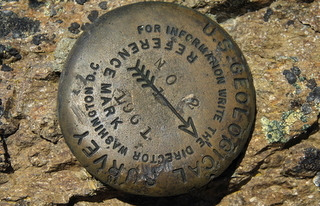 If you’re not familiar with what a bench marker is, maybe you’ve heard them called "survey markers". Many high points in the United States have them. They're fun to spot when you sit down to enjoy your lunch after a steady uphill hike! Here's a photo of one from the North Cascade range in Washington State. You could also choose pins, key chains, paperweights, magnets, and zipper pulls depicting a favorite place or hiking bucket list destination. And the best part? Hiking For Her readers receive 10% off any order, by using this coupon code: HFH10. NOTE: I do not earn a commission on your purchases. I just thought these were too cool to pass up! And now I know what to get for my husband's upcoming birthday! Set yourself the intention of passing along the gift of hiking in unspoiled places to future generations. I recently received a message from the American Hiking Society urging each American hiker to contact her Congresspersons about the Land & Water Conservation Fund (LWCF). This reminded me that I need to take whatever small actions I can to ensure future hikers will enjoy what I've enjoyed. If you'd like more information on how to take a small but intentional action, go here. Thanks for taking the time to read this newsletter! I love hearing from all of you, and enjoy pondering your comments and questions. If you’d like to nominate yourself for the HFH’s Hiker Hall of Fame, it’s not too late! Send me a few lines about your biggest hiking adventure of 2014, and why it meant so much to you. Wouldn’t it be great to share it with other women hikers? My wish for you as we head toward December solstice is peaceful trails AND plenty of time to savor the sights, smells, sounds and sensations on them.